Older cats and dogs suffer from arthritis and joint pain just as frequently as senior humans do. In fact, it is the most common chronic disease affecting pets in their later years. Fortunately, arthritis in pets is treatable with medication, orthopedic surgery, or a combination of both treatments. Why Do Pets Suffer Arthritis and Joint Pain? Joint cartilage in dogs and cats deteriorate in a manner similar to the way human joint cartilage degrades when affected by osteoarthritis or rheumatoid arthritis. Cartilage acts as a cushion between bones that work together to promote movement. When this cartilage starts losing its lubricating properties, it dries, stiffens and shrinks away from bones. Consequently, exposed bones scrape against each other, causing joint pain, inflammation and restricted movement. Certain dog breeds are genetically predisposed to suffering arthritis, such as cocker spaniels, Bull mastiffs, German Shepherds, Labradors and pugs. Cat breeds susceptible to degenerating joint cartilage and joint pain include Himalayan, Siamese and Persian cats. Reluctance to climb stairs, jump, run, etc. 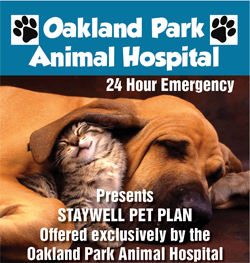 Oakland Park's animal hospital is fully equipped with state-of-the-art tools designed to diagnose and treat your pet's painful condition. With ultrasound and digital radiography devices, we offer the ability to give you an accurate diagnose the first time so your pet does not need to suffer unnecessary exploratory surgery. Additionally, orthopedic surgery may be able to repair arthritic joints by replacing damaged joints with synthetic bone that alleviates pain and improve range of motion. We often suggest cold laser surgery as an alternative to invasive orthopedic surgery primarily because orthopedic surgery is physically and emotionally taxing on older pets. With cold laser surgery, pets experience less pain and quicker recovery times because laser therapy promotes healing. Your pet is not anesthetized during cold laser treatment because no cutting is involved with this type of non-invasive technique. 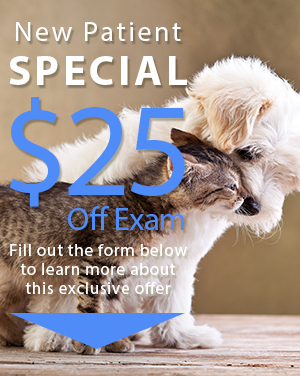 Instead, your pet will feel nothing more than a soothing sensation of warmth as our veterinarian in Oakland Park moves the cold laser device over the animal's affected joints. As the laser encourages release of endorphins, your pet will soon start to feel the pain-reducing, relaxing effects of endorphins in his joints. Cold laser therapy further supports relief from arthritis symptoms and joint pain because it promotes production of ATP (cellular energy). As ATP levels increase, the ability for damaged tissue cells to "recharge" and heal themselves also increases. In addition, cold laser therapy stimulates circulation of lymphatic fluid, providing your pet's joints with the nutrition and oxygen necessary to heal injured tissues.